Well these were taken when I was 8 months pregnant. 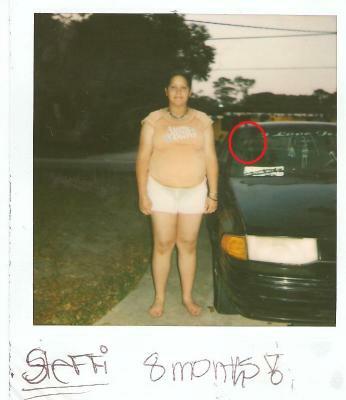 It was also the same day that our home was broken into (if that means anything)... well we were taking pictures with the Polaroid camera thing my mom bought to use for the birth of my son. If u look, there's alot of smoke but my mom wasn't smoking and it was a clear night. To left if u look behind me you can see what looks like a ghost. It looks like a little boy or girl with something in his or her mouth. You can see that face on both pictures we took. That look like a face. If you zoom in on the highlighted area, you can see three eye-shaped things floating. History depicts that everywhere on the earth there were at one time some sort of grave or cemetery almost everywhere you walk. 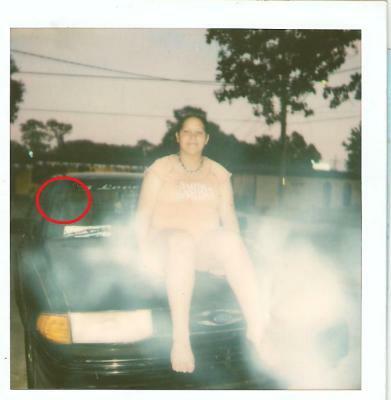 The place in front and behind your car is no doubt once a cemetery, that is why one picture shows the ghost face and the orb at the same instance.These ghosts (never left it's place of burial). The second photo shows us the ghost face and not the orb. These apparitions, ghosts and spirits are just still hanging around who knows for how long but never the less your photos prove once again that there is more than one force on the face of the earth and we humans are never alone. Our vision keeps us from not knowing the unknown.